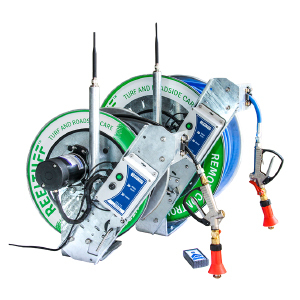 If you are looking for the longevity and reliability in your weed spraying hose storage, look no further than ReelTuff Remote Control Reels from Reel Tech. Highest quality galvanised construction will continue to work alongside with you in all weather conditions. Ideal for use in both low and high pressure spraying duties in golf courses, council parks, urban landscapes and roadside care. With ergonomic and safety features like Reel-In-Control™ Remote and Safe-R-Reel™ maintenance free Non-Belt/Chain Direct Drive System as standard, the ReelTuff hose reels are designed for both professionals and owner operators alike. 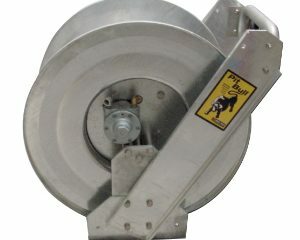 The Reel Tuff™ reel is a world-patented, Australian designed and manufactured direct drive hose reel. The hose reel features unmatched flexibility in size and capacity. It has an adaptable Reel-In-Control remote. A unique Non-Belt / Chain Safe-R-Reel™ gearbox, that ensures a controlled speed during rewind. ReelTuff offers superior craftsmanship and quality galvanised construction that has been proven to withstand some of the harshest environments in Australia and overseas. The ReelTuff Hose Reels are easily installed to many vehicles with 12V power supply including utility vehicles, ATV’s, golf buggies, and more. 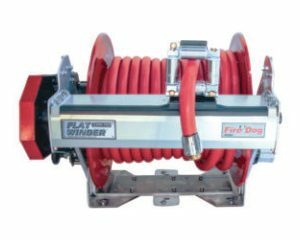 You can use the Reel Tuff™ hose reel as a single unit or in a mirrored configuration for dual independent hose reel setup, allowing multiple operators to cover large areas in half the time. 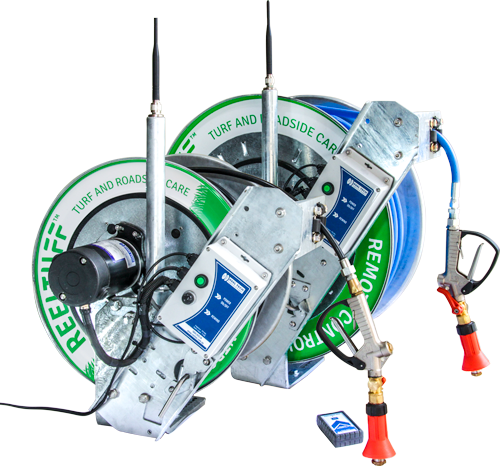 You can also use Reel Tuff™ Hose Reels with your spray equipment to enjoy the outstanding safety features, and achieve more spraying in less time and effort than conventional methods using manual reels. Benefit from the Reel-In-ControlTM automatic hose rewind at a single press of a button, and the motor drive capable of safely retrieving the hose even at full extension.